I'm writing this post from what I personally believe is one of the nicest parts of France; "La Provence". This geographical region in the South-West of the country, is a common name for a large area consisting of 6 different "Departements"; Vaucluse, Bouches-du-Rhône, Hautes Alpes, Alpes-De-Haute-Provence, Alpes Maritimes and Var. It extends from the left bank of the Rhône river on the West, the Italian border to the East and is bordered by the Mediterranean Sea to the South. This week we are travelling by rental car, through the Vaucluse, Alpes-de-Haute-Provence and Var. 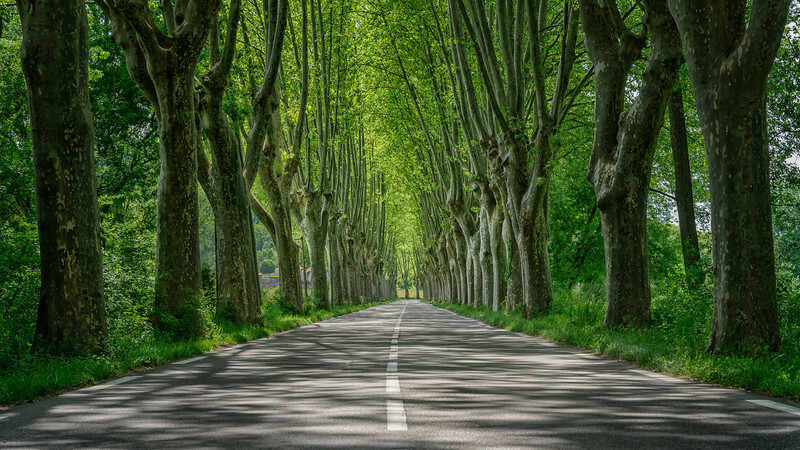 On our way to the Lac du Saint-Croix, we passed through this beautiful lane of trees. A great place to stop the car and make a "Pic(k) of the week"! If all goes to plan, tomorrow I'll be off to Southern France for a week of aviation fun. Sunday I'll be attending a large airshow at Salon de Provence, to commemorate the 60th anniversary of the French aerobatic demo team, "Patrouille de France". Starting next Tuesday, I've booked an intermediate four day paragliding course together with my wife. We have done a beginners course some time ago in the French Pyrenees and are now looking forward to pickup where we left and hopefully perfect this amazing flying experience! 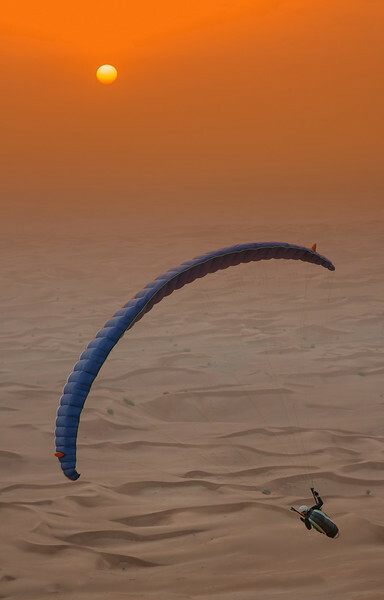 Paragliding is a sport where one runs of a mountain slope with the help of a fabric wing (no engine) and then can, if the weather is right, stay aloft for hours at a time. In my opinion it is the purest form of flying! A few weeks ago, I photographed a few friends paragliding of the Fossil Rock mountain range in the desert about 45 mins East of Dubai. They flew until after sunset and clearly illustrated the "joy of flying" ! In preparation for the trip, I've mounted my GoPro video camera on my paragliding helmet and will try to capture some interesting footage. Beside the aviation photography next Sunday, there also should be plenty of landscape photo opportunities throughout the weeklong trip in the Provence. October 2012, I started my conversion as a Captain onto the Airbus A380. Having completed 6 months of flying the super-jumbo all over the world, it has become my preferred Airbus from a pilots perspective. More than a decade ago, I've flew the smaller A319, A320 and A321 for my national airline in Belgium, while the last ten years were spent on the twin engine A330 and the larger four-engine A340's. The 569 ton A380 is powered by four Engine Alliance GP7270 engines delivering a mind boggling 140.000 lbs of total thrust. 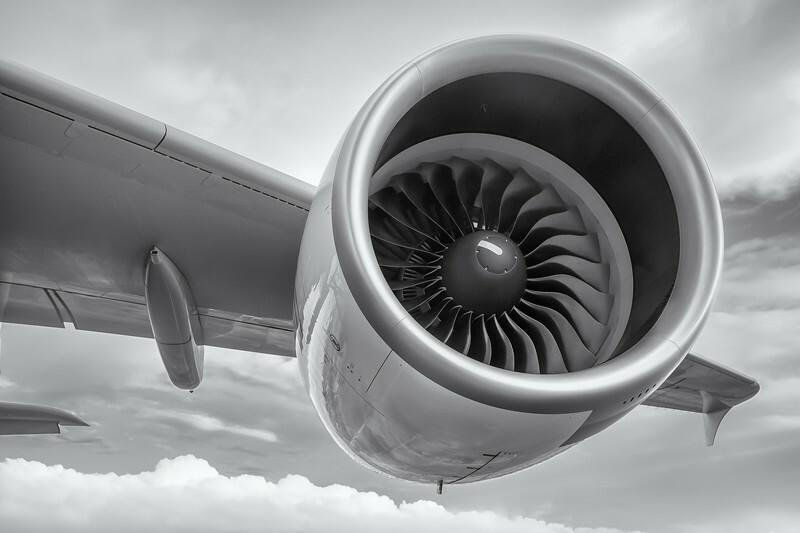 The Engine Alliance joint-venture between General Electric and Pratt & Witney was formed in 1996 to combine the best of the mighty GE90 and the PW4000 engines. Both of these can be found on B777 aircraft. The GP7270 engine has a diameter of 3.16 m compared to 3.40 m for the GE90 which powers the Boeing B777-300ER. The latter however develops significant more thrust, 115000 lbs compared to 70000 lbs. The image above shows the left outer (engine 1) engine of the A380 on the ramp in Auckland, New Zealand earlier in the month. Next week, I'll be off to the South of France, where I'll bring you some more "Aviation photography" from the 60th anniversary of French team Patrouille de France. Meanwhile, more Airline photography can be found here. Remember with regards to engine power: "Lots is good, more is better and too much is just enough". Those of you following this blog for a while, probably know that I do a significant amount of travelling around the globe. A quick check shows me that over the years, I've now been to 84 of the Worlds 246 countries... Just over one third, but a long way to go! During these travels there have some cities that clearly stick out. Sydney, the capital of the Australian city New South Wales, definitively meets this challenge! It surely deserves a place in my personal top 10, along places like New York, Singapore, San Francisco and Hong Kong. The world renown Sydney Opera House and Harbour bridge are a joy to photograph at dusk. There are a few places, where one can frame both Sydney icons together. The image above was made from the Luna park area at the North side of the bridge. While editing the image I also developed a Black and White version. I asked my Bjorn Moerman Photography Facebook page subscribers as well as my Google Plus followers to choose between the colour and Black and White version. It seems that the majority wants colour! Democracy in Photography. Here you go! On a side note this is now the second Fuji X-E1 image, that made it into my Architectural Portfolio. Last Sunday an Italian gunman shot and seriously injured two policemen near the Prime Minister office in Rome. 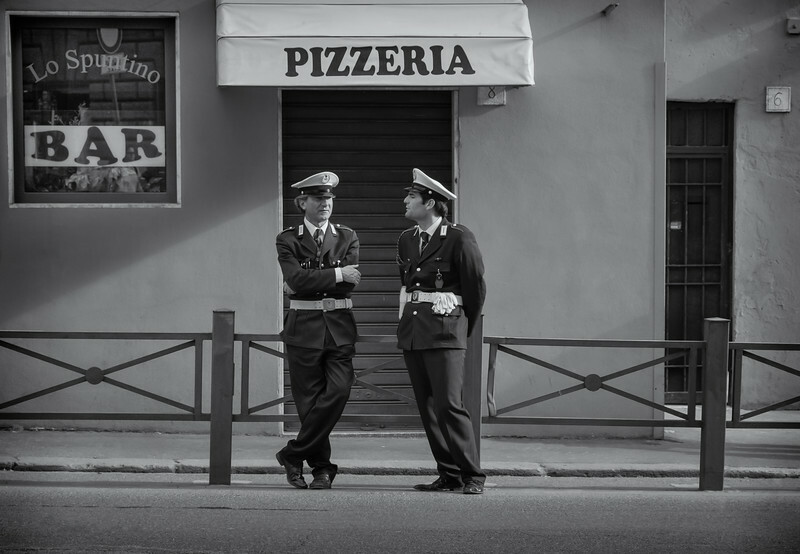 More Black and White, Street Photography images from a few day ago in Rome, can be found here.